An advertising campaign designed to raise awareness of counterfeit dental products has scooped an award run by the British Dental Journal. The British Dental Industry Association (BDIA) campaign -part of its Counterfeit and Substandard Instruments and Devices Initiative (CsIDI) - was the most likely to elicit action by the viewer out of 29 advertisements entered into the competition. Notably, the survey showed that 45 per cent of respondents took an action upon seeing the CSIDI campaign, with most readers visiting the website as a result. 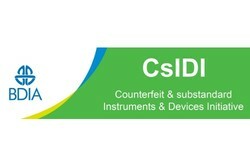 The CSIDI, which promotes awareness and action on counterfeit and non-compliant dental devices across the sector, was also voted fifth in the ‘believability’ category and sixth in the ‘attention-getting ability’ category, according to the BDIA. "It is encouraging to see that our new CSIDI advertising campaign is resonating within the industry," commented BDIA marketing manager Dianne Gettinby. "In today’s marketplace it’s essential to protect patients and colleagues by ensuring everyone knows the provenance of the products they purchase." The BDIA says it has been collaborating closely with the UK Medicines and Healthcare products Regulatory Agency (MHRA) and its industry partners to ensure all members of the dental community are aware of the implications of their purchasing decision. It recommends that all members of the dental care team report anything suspect at www.bdia.org.uk/device-reporting.